Use Direct Ferries to compare and book your Ferry to Ventspils in Latvia to get the best deal. Not only will you get a ferry price for your chosen sailing but we’ll also show you prices for ferries to Ventspils around your preferred departure time as well as sailings to alternative destinations to ensure you get the best available price for your trip. 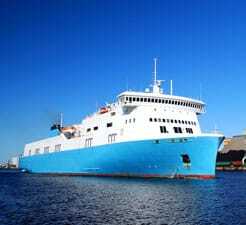 It really is simple to save on your ferry to Ventspils with directferries.co.uk. All you have to do is select your place of departure, ferry route, number of people travelling on the ferry to Ventspils and hit the search button. I was late for my check in during busy traffic in Germany and when I called Direct Ferries customer support line I was told that if I don't check in 2 h before departure time I will not be able to travel by ship.I was late for 1,5 hours to be exact my ship departure time on the confirmation was 4 pm and I arrived at 3;40 pm and everything was ok. I managed to check in and still had some time to wait until loading began.NOT sure of the competence of the Direct Ferries staff but it was not good experience when I called them on the way to ship in busy traffic thinking that my holiday and everything will be ruined and I was told there is nothing they can do,not even check the time of the departure of the ship,nothing,not even suggest any other phone numbers,who to call on the Stenna Line company,completely nothing. That was my experience. Since I am 80 years old I was very greatful that the girls at the check in was very helpful so I didn't have to walk any extra distances at the check in both in Nynashamn and in Ventspils. What I don't understand is why you can't go to your car directly at arrival. You get lured out of your cabin and then have to stand up and wait with aching joints for 15-20 min and hustle and sweating among other people at the foyer. "The most boring ship in the sea!" This trip was meant to be a birthday treat for me as we would have normally driven from France all the way to Estonia but instead we thought we would enjoy a relaxing, fun time on a boat where we thought we would be entertained or at least be able to go shopping as and when we wanted. Instead our entertainment was a large tv that didnt have any English films or programmes (yet most people can understand our language), the shop was the smallest shop in the world that only opened for about 2 hours during the whole trip. And, when we were finally in the harbour at our destination, i mentioned to my husband that i would like to stand at the front window and watch the boat dock when i was suddenly ushered away from the dining area (front of boat)by a young lady telling me the restaurant was closed already! Grrr, it was clear i did not want anymore food as she was the one that saw us to our table at dinner, it was obvious we were enjoying the view so what harm were we doing? Spoilt the only bit of fun we had! One good thing, the food was tasty and portions varied depending on who was serving. Not a happy crew member! If i had to take this boat again, i would take many things to amuse myself. Oh, and we were not told beforehand that we would not be allowed back out to our car after the boat was moving and we had our pillows and blanket left out there, yet a lady was allowed to visit her dog on same deck that was in a cage! Hmmmmmmm, rules should be obeyed by Everyone, NOT just if your face fits!